Now here is a name that is a blast from my past. When I was first delving deeply into underground metal VIRGIN STEELE was one of the bands that I was very interested in. Their first LP (1982ish) and "Guardians of the Flame" LP (1983ish) were great. I lost track of them over the years and am blown away that they seem to be going strong with this new CD "The House of Atreus" a thematic album that is, in the band's words, "A barbaric-romantic opera." The album seems to be a Sophocles/Euripides (poor Aeschylus, forgotten again) style Greek tragedy centered on the classic story of Agamemnon and his children Elektra and Orestes. This album is "Act 1" and thus I assume that there will be more "Acts" to follow on later albums (five acts is the tradition but the liner notes seem to indicate only two). Musically the album is incredibly self indulgent with only about half the time spent on heavy metal. The rest of the time the music is grandiose filler seemingly meant to serve as exposition and a source of dramatic tension. Unfortunately it doesn't always work and listening to this album straight through more than once is proving to be a chore. 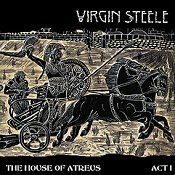 When VIRGIN STEELE does settle down enough to play a metal tune they are pure, classic power metal that really is in the style that pre-dates the term "power metal". Fans of everything from RUSH to RAINBOW to DEEP PURPLE to even MANOWAR are going to make a connection to this. All in all "The House of Atreus" is extremely hit and miss for the casual fan although I would guess longtime followers of the band are going to hail it as an "epic classic".